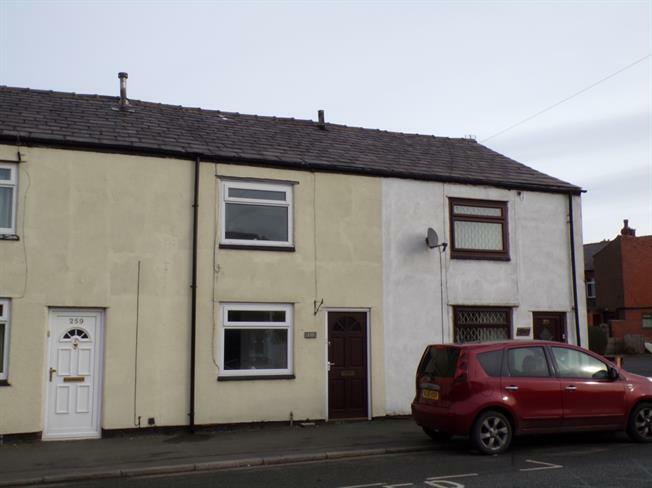 2 Bedroom Terraced House For Sale in Manchester for Asking Price £80,000. This property's price has dropped from £89,950 to Asking Price £80,000. WONDERFUL CHARACTER, EXPOSED WOOD BEAMS, RURAL VIEWS TO REAR, TWO GENEROUS BEDROOMS, GARDEN. Ideal investment opportunity. Exposed wood beams in lounge. Hearth/mantelpiece in lounge. Under stairs storage. Kitchen diner with views to the garden and fields. Metal storage shed in garden. To the first floor there are two generous bedrooms, both with in built storage. The ground rent is 2.00 per annum, the lease 850 years from 29 September 1969. .
Radiator, vinyl flooring, part tiled walls, ceiling light. Roll top work surface, wall and base units, single sink and with mixer tap with drainer, space for washing machine. Carpeted flooring, ceiling light. Radiator. Heated towel rail, vinyl flooring, ceiling light. Low level WC, panelled bath, semi-pedestal sink.